It all started with a question. In Kammbia, a land halfway between magic and our wildest dreams, belief in the ancient ways grew cold. Its people grew apart. Diondray Azur wanted to know why. A son of the most prominent family in Charlesville, Diondray learns that everything he ever knew about his roots--his world--was a lie. Determined to find the truth, he discovered an ancient book. In that book, the prophet Oscar Ortega promised that one of his descendants would unite this divided land. Diondray wondered if that descendant might be himself. Forced to leave his native Charlesville, Diondray set out on a journey to see if indeed he was the promised one--and if so, to unite all its peoples. That first step marks the beginning of the Kammbia series, Marion Hill's four-volume adventure fantasy story that follows Diondray as he seeks that which his land has lost. Adventure and danger are never far away. Now, the first two books in the series--Diondray's Discovery and Diondray's Journey--are available together in the Omnibus Edition. If you want a compelling read to keep you company on long winter nights, you've just found it. Heart-pounding adventures and a set of characters so real they nearly come to life will join you on your journey. Discover the magic that can happen when you seek the truth. Fall in love again with your own hero's quest. 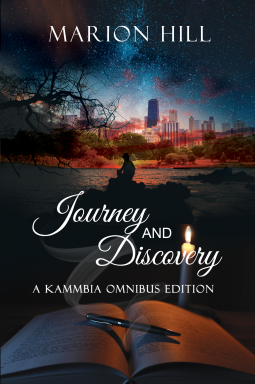 Get your Kammbia Omnibus Edition today.